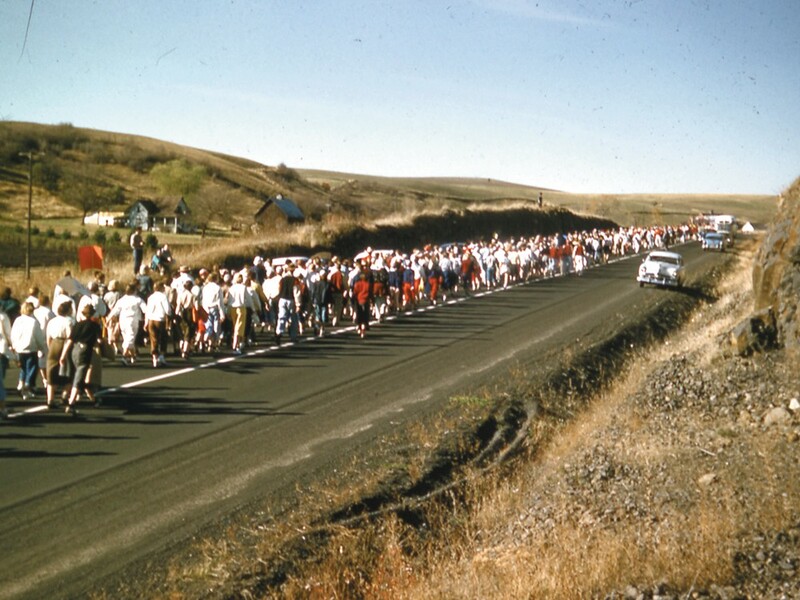 Washington State students make the "Loser\'s Walk" to the University of Idaho after an upset loss in 1954. When Flip Kleffner was the president of the University of Idaho’s student body in 1954, he made one hell of a promise on the eve of the school’s biggest football game of the season. The Vandals did beat Washington State the next day, by a score of 10-0 in Pullman. The upset win (Idaho was 0-5 going into the game) was their first victory over their 8-miles-away neighbor in 29 years, and the Idaho administration figured they could honor Kleffner’s promise and shut things down for a day. After all, for the first time that pretty much anyone on campus could remember, about 1,000 Washington State students — cheerleaders and members of the marching band included — were about to make the hike from Pullman to Moscow on foot in a ritual known as the Loser’s Walk. That 1954 walk was a big deal. It even got a little national press. But it had been a tradition since the 1930s, when the editors of the two schools’ newspapers wagered an 8-mile hike on the outcome of the football game. Soon, student leaders got in on the bet and the conglomeration of losers trekking across the rolling hills that separate the two small-town campuses became ritual. Most of the walks went from east to west, Idaho students cheerfully marching over to Pullman, as you can see on archival film from the WSU library. Kleffner, who played football for the Vandals until injuries sidelined him, went on to serve as the alumni director at Idaho. He still lives in Moscow and follows Vandals football, but acknowledges that the football rivalry, known as the Battle of the Palouse, has cooled — if not completely fizzled — since those years. It’s tough for a rivalry — and a tradition like the Loser’s Walk — to survive when the results are so lopsided. Since the Battle of the Palouse began in 1894, Washington State leads the series 70-16 (with three ties) and most of those Idaho wins came before 1930. Since the 1954 stunner, Idaho has won only four matchups, including consecutive games in 1999 and 2000. WSU then reeled off seven in a row. The rivalry, which went dormant after 2007, will be resuscitated Saturday night in Pullman. That was the third time the teams put the Battle of the Palouse on extended hold. Between 1979 and 1997, Idaho and WSU matched up only twice. “Rivalry? To me, a rivalry is when the teams line up for the kickoff, nobody can be sure which one will win,” former Idaho coach Jerry Davitch told reporters before the 1978 game that effectively put the Battle of the Palouse to bed for the next two decades. The Loser’s Walk had ceased nearly a decade before. These days, Washington State plays in the illustrious Pac-12 Conference while Idaho has struggled to simply remain in the game on the FBS side (you might remember this as I-A) of Division I. Before that, Idaho was in the Big Sky Conference and Western Athletic Conference, fueling a heated rivalry with Boise State that overshadowed the one just across the state border. WSU, of course, had the Huskies to deal with. But on Saturday, the Battle of the Palouse returns to Martin Stadium. Washington State is 2-1, with a solid victory at USC under its belt; Idaho, though winless, is showing signs of improvement. Among the universities’ student bodies, there’s a feeling that the rivalry between the students (forget what happens on the field for a moment) is reawakening. Over the summer, both schools’ student governments met up and thought they’d breathe some life into the competitive spirit between Pullman and Moscow. “We agreed that we wanted to bring the student rivalry back to this unique situation that we have being so close together,” says Kevin Massimino, vice president of the Associated Students of WSU. WSU and Idaho student bodies plan to compete in food drives, a service hours contest, and at some point a tug-of-war set on the Idaho-Washington border that they hope will set a Guinness World Record. Then, just this week, student leaders decided to up the ante. The Loser’s Walk, at least in some form, would return. “It’s a handshake agreement between [the two student governments]. It’s nothing super-official, but we’re of the opinion that you have to start somewhere,” says Associated Students of the University of Idaho President Max Cowan, who sees a healthy rivalry between the schools as a way to focus on community involvement. Whatever the outcome on Saturday, one set of students is going to be strapping on some comfortable shoes next week. They’ve got 8 long miles ahead of them.